Aqua Heights is an ideal couples retreat with the versatility to host a small family! You'll love waking up in this spectacular location! Fully self-contained and situated beneath a luxury home. Accessed via landscaped stairway from the shared parking area above. The studio styled with generous living, dining, kitchen and bed, stunning bathroom and separate study/sleeping area. The main bed is a King. There is a queen sofa bed in the living area and an office desk in the study area that folds out to create a quality single bed. 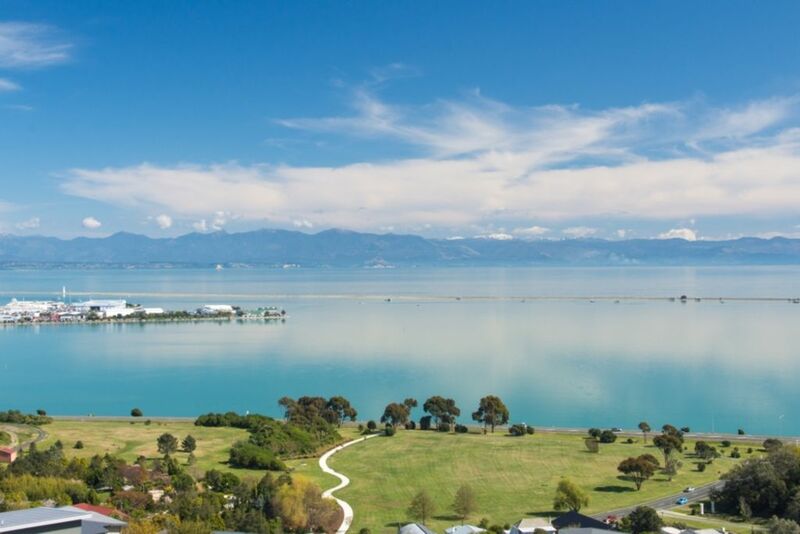 Glass framed balcony and large sliders from the apartment offer exceptional views over Nelson, The Haven Estuary and beautiful Tasman Bay. No party or venue use. No Smoking. No pets. General Terms and Conditions apply. A bond/card-authority will be required. The home above may be owner occupied, however the apartment offers excellent privacy for your stay. Extras: Cleaning and Linen (Required, NZ$50.00 per stay); Booking fee (Required, NZ$25.00 per stay); Portacot and highchair available for hire (NZ$15.00 each). Self-contained luxury with own separate entrance! Aqua Heights will be presented with the main bed & King prepared for your stay. If the sofa bed is required, bedding will be supplied. All utilities, linens & towels, use of property amenities including WiFi, pantry & sanitary basics, departure linen service & standard housekeeping up to 1.5 hours are included. An on call property manager is available at all times. Extra charges will apply where additional cleaning or excessive rubbish disposal is required. It was perfect for us. Thank you. Fresh modern studio apt, fully equipped and functional. Lovely sunny balcony/patio with great views and sunsets. Starter necessities were thoughtfully provided. Unit wd work best for a couple, though you might manage with a small child or two. Other permanent occupants of the building (one couple) were friendly and helpful. In a choice neighbourhood and close enough to town without being in it. Room was in perfect condition and has everything you need for a comfortable stay. Room was in perfect condition and has everything you need for a comfortable stay. The view is absolutely beautiful and location was nice and close to the city centre ! Modern and clean apartment with beautiful views. Modern and clean apartment with beautiful views. Would recommend to people and happy to stay again. Had everything you needed. Everything you need and a place that has you thinking man I don't want to leave! Everything you need and a place that has you thinking man I don't want to leave! Special touches to make it extra special and an amazing view! Can't recommend this stay enough! Had a total blast in nelson at Aqua Heights! The Nelson region is known for its year-round sunshine, golden beaches, national parks, boutique wineries, micro breweries and a large creative community of working artists. Nelson is within easy distance to three national parks and two of New Zealand’s Great Walks including the Abel Tasman Coast Track (New Zealand’s most popular track, a coastal wonderland of sea, sky, rocky headlands and bright golden beaches) and the Heaphy Track (New Zealand’s longest track). The Nelson Lakes National Park is set amidst the mountains and glaciated valleys South of Nelson city and features beech forests and the beautiful jewel-like lakes, Rotoiti and Rotoroa. Kahurangi, New Zealand's second-largest national park, comprises 450,000 hectares of mostly upland wilderness, with magnificent three to four-day hiking trails. Nelson attractions and activities offer a great range of adventurous outdoor activities including, scenic cruises, art attractions, canoeing & kayaking, horse riding, scenic flights, canyoning and much more—you name it, you can do it! Add to this locally grown produce, freshly caught seafood, great markets on Wednesday and Saturday, historical streetscapes and waterfront restaurants and you'll see that it offers a thoroughly pleasurable base for your holiday break!